Ralph Lauren SS Crossed Mallet Pink Stetch Mesh Polo Shirt Size L.
WOMENS RALPH LAUREN V NECK T SHIRT - SIZE MEDIUM - Navy. Condition is Used. Dispatched with Royal Mail Signed For® 2nd Class. Ladies Ralph Lauren Shirt Size 6. A beautiful white semi-fitted shirt. It has long sleeves with buttons to the wrist. Ralph Lauren Logo in blue on the left hand side. Looks lovely with jeans, trousers, skirt or shorts. Beautiful cotton. Only worn a couple of times, originally cost £45. Excellent condition. From a pet and smoke free home.Happy Bidding. Womens Ralph Lauren Pink Striped Shirt. Dispatched with Royal Mail 1st Class. Ralph Lauren Ladies shirt. Condition is Used. Dispatched with Royal Mail 1st Class. Ladies Ralph Lauren shirt. In excellent condition, from pet and smoke free home. White with RL motif in navy stitching to cuff of sleeve. Navy and white striped collar with buttons. Has 3 spare buttons stitched to inside. US size 8 which I think is equivalent of UK size 14. Ralph lauren ladies shirt size 10. Condition is Used. Dispatched with Royal Mail 1st Class. RALPH LAUREN SLIM FIT POLO TOP IN A DUSKY PINK COLOUR, GOLD APPLIQUE LOGO ON FRONT, WORN BUT IN GOOD USED CONDITION. Ralph Lauren Top Ladies M. Condition is Used. Dispatched with Royal Mail 1st Class. Womens Ralph Lauren Tee - Size Small. Condition is Used. Dispatched with Royal Mail 1st Class. RALPH LAUREN PINK TOP SIZE SMALL. LONG SLEEVE, RUFFLES AT NECK. WORN BUT IN VERY GOOD USED CONDITION. Ladies RALPH LAUREN - SUPER SLIM FIT purple & soft white stripy shirt blouse top with embroidered logo and long sleeves. Labelled as a size 4 / 160 / 88A (US size ?). White Ladies Ralph Lauren Shirt Size M. A beautiful shirt with a ruffle front. Can be dressed up or down, looks very classy. Only worn a couple of times paid £50. Excellent condition.From a pet and smoke free home.Happy bidding. Womens Ralph Lauren shirt, size 10. Lovely lightweight fitted shirt, blue pinstripe with pink pony motif. Very good condition and only worn once. Items will be sent via first class recorded delivery. No returns. Please message me with any questions or if you need any measurements. Check out my other clothes and shoes for auction - I can combine postage. Thanks for looking. Happy bidding! womens ralph lauren t shirt Size M / Size 10. Condition is Used. Nearly new only worn twice. Dispatched with Royal Mail 1st Class. Ralph Lauren Ladies V Neck T Shirt White Size Small. Condition is Used. Dispatched with Royal Mail 1st Class. Ladies long sleeve t-shirt from Ralph Lauren in size small. Colour black with purple stitched logo on left chest area. 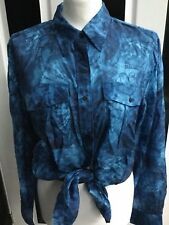 Ladies Blue Long Sleeved Ruffle Ralph Lauren Top Size Medium Pre Loved. with hip Detail Condition is Used. Dispatched with Royal Mail 2nd Class. Ralph Lauren Ladies white Shirt. Lauren signature embroidered pony finishes the piece in pure Polo style. Washed cotton oxford and a trim silhouette join forces in this modern take on the classic shirt. Genuine Ladies Ralph Lauren Blouse Size XL . Lovely design. Ragged neck. Bought new but never worn. Dispatched with Royal Mail 2nd Class. Womens Ralph Lauren Over Shirt White Size M. Condition is Used. Dispatched with Royal Mail 1st Class. Ralph lauren Ladies T shirt Size S! New Ralph Lauren Ladies Purple White Checked Cotton Shirt Size 10 and measures 21” pit to pit. Ladies Frill Neck Sleeveless Top. It has a full neckline frill detail. with a front keyhole button fastening. LAUREN RALPH LAUREN. A fitted thigh length sleeveless top. In a fabulouswhite and blue stripe. Women's Ralph Lauren jumper size Large. Dispatched with Royal Mail 2nd class. New without tags, given as a gift but too big. Smoke free and pet free home. Ladies Ralph Lauren Long Sleeve Top Size S. Only worn a couple of times.Has lovely beaded detail. Dispatched with Royal Mail 2nd Class. Ladies genuine Ralph Lauren Tee shirt Size M . Condition is Used. Dispatched with Royal Mail 1st Class. Lots of other items listed. Ralph Lauren Long Sleeve Skinny Polo Green Size M. Condition is Used. Dispatched with Royal Mail 2nd class. Sold as seen in pictures. Condition is Used. used but in good condition no tears or missing buttons. signs of wash and wear-tiny mark front and back and marks to Sleeve-see last photos. If your order exceeds 2kg we'll happily give you a quote. Womens Ralph Lauren Purple T Shirt. Condition is Used. Dispatched with Royal Mail 1st Class. RALPH LAUREN Classic Slim Fit Pink Shirt. US6/UK10. Used. Excellent Condition.